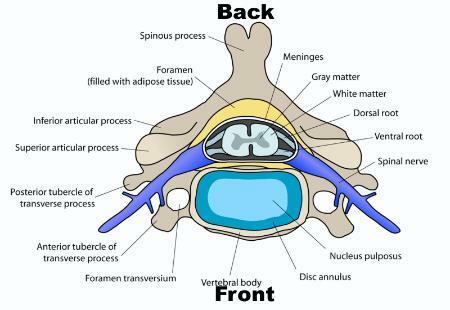 A bulged disc occurs as a result of an injury. The original damage often occurred years prior to the symptom of back pain arriving. The problem with this injury is that discs are made of cartilage and cartilage more often than not, breaks down, as a result of mechanical stress, faster than we can repair it. Unless that is we go to a lot of trouble but even then total repair is difficult. The symptoms of a disc bulge can vary from a mild ache to an excruciatingly severe pain radiating along nerves - such as down a leg or into the hips. The bulge, just like symptoms, can come and go depending on the positional stresses being applied to the disc tissue and the subluxation (misalignment ) present at the spinal level involved. That being the case, it makes sense to look after the disc as much as possible to prevent a recurrence. The main sign of a problem, which most people can easily recognize is pain. Pain is usually not present at the time of the original injury. It most commonly comes on as a result of many years of disc cartilage wear and tear. Pain relating to disc bulges occurs only when the disc tears enough to not be able to retain the jelly mass the nerve tissues (the spinal cord or spinal nerves as they exit from the spine), the jelly displaces the remaining rings of the cartilage of the disc, which then presses on the nerves. This often results in pain being felt. The tearing process itself may have progressed slowly over many years without any signs of discomfort. retrolisthesis displacement of the spine at the level of a disc bulge. (1) This points to a high probability of benefits from chiropractic adjustments for pain relief. The limiting factor in this situation is the degree of tearing of the disc cartilage and the degree of retraining the patient is willing to undergo so as to add stability through re-educated usage patterns (lifestyle). recurrence of the disc bulge, further injury and any repair. What to do now that you know you have a disc problem.? given an opportunity to migrate backward towards the nerves. on. Bending backward or rotating is usually OK.
mobile). This works best with fresh injuries. 4 Immediately follow each walk with 30 to 90 minute rest lying down. mineral supplement that supply copper as one of its nutrients. A small study has shown that doing nothing will eventually result in the resolution of "Pain". If that is the only outcome people are after then that is the end of it usually at the end of 18 months to 2 years people with disc bulges will be out of pain. Since the disc is one of the soft tissue structures to provide joint stability, if it is further damaged, then in spite of the fact that our "do nothing" person is gradually getting out of pain, the spine at the level of "stuckedness" is still progressively becoming more unstable. Not a good idea! Pain is a sign to a person that all is not well. If pain either comes on, or gets worse from making some particular movement, that is a sign that more damage may be happening as a result of the movement or abnormal pressure being applied. Pain is NOT BAD. Pain is essential to prevent further damage. It is your warning to get something done about what is causing the pain. It is NOT a sign that your need to turn off the alarm that has just given you a good warning signal. Some relief from pain will certainly give you greater comfort. It is NOT a good idea to totally turn off pain. Knocking the pain down to "liveable levels" is probably the way to go, which can be done by a range of over the counter analgesics (pain dampeners). Inflammation is one of the signals to the body that a repair needs to take place. By taking NSAIDS you are taking away that repair signal. NSAIDS while handed out many times without a second thought by medical folks, patients need to keep in mind that they are not without their dangers. 9 Wiesel, MD:�Are drug companies shading the truth about Cox-2 inhibitors?" inflammatory drugs." Lancet. 1994 Apr 30;343(8905):1075-8.
at level 3 is normal in shape and position. height is near normal, but there is tearing present. Tearing means impaired stability of joint. in the best possible position over extended time frames. 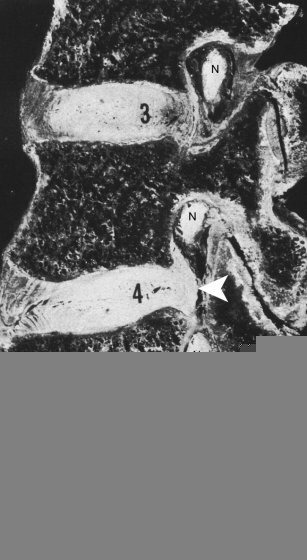 The nerve at level 5 is displaced though no longer badly compressed. Spinal bones are supposed to be held in a stable yet flexible, movable manner. The discs are the main structure that enables this to happen. stability, so recurrent misalignment is common. displaced disc matter (disc bulge). does illustrate well the tearing of disc cartilages.